Hey everyone! We just finalized another half-dozen Fennux Loungers. 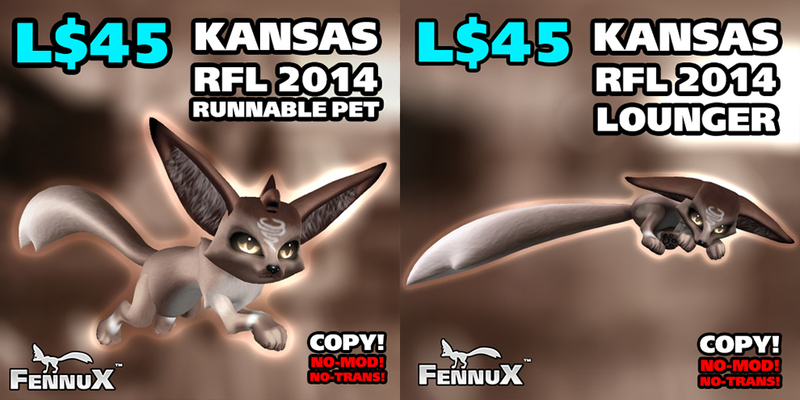 These are only available at the Official Fennux Sim, so head on over there to start collecting them all. What’s new? Galaxy, Tango, Chomper, Ginger, Lanky and Royalty. Congratulations to Doctor Adagio for winning the Create-a-Coat Contest! Doctor Adagio will be receiving L$5,000 in-world, as well as an “8 for 4 Weeks Kibbles”, an Eternal Pet Crystal, and a Scorchy LE Den with a few random traits on it. We also had 3 Runner Ups! In no particular order: Czarnia Vintner, Six Sahara, krystajcf2u Resident are all winners of L$500, “4 for 4 Weeks Kibbles” as well as an Eternal Pet Crystal! There were also 36 other entrants – each and every one of them will be receiving an Eternal Pet Crystal! There were lots of great ideas submitted, so we thank each and every one of you for entering. There’s bound to be another one of these contests later on – so check back in often with our news page. If you submitted an entry, please look under the “Objects” folder of your “Second Life Inventory”, you should see the Fennux Eternal Pet Crystal delivered there. We will have sent all of these out by August 1, 2014 @ 1:00AM SLT. The August 2014 “Scorchy” Limited Edition Fennux Coat is here! NOTE: THE LE IGNIS EYES ARE VERY RARE, DO NOT EXPECT TO GET THEM, BUT IF YOU DO GET THEM – CONGRATULATIONS! And that’s all there is to it! Enjoy your Scorchy LE Fennux Den, and your 12 Days of Reserve Food! WHERE DO I GET MY SCORCHY LE FENNUX? The Wishing Well exists only on the Fennux Sim. We have 1 setup next to every Crafting Machine, and of course these Wishing Wells are used to turn any 12 Fennux Dens into 1 Scorchy LE Den (and 12 days of Reserve Food). Yes there is a SMALL CHANCE to get “LE Ignis Eyes”, but the odds are roughly about a 0.5% chance to obtain, so don’t expect to get them! The LE Ignis Eyes can pass onto other coats, so even if you don’t get them from Wishing, you will have opportunities to obtain them in the Secondary Market later. Most Fennux however will have regular eyes from a starter den, very similar to Crafting – the only thing that is “LE” on most Inferno LE Fennux is the over-ride of the Fennux Coat. It’s more-or-less exactly like Crafting, except for the fact the coat will not pass. HAVEN’T SEEN THE NEWS ABOUT THE FENNUX FANTASY REGION? GO HERE! If you ever need a CSR (Customer Service Representative), please visit the Official Fennux Sim, and use our “CSR Board” at the landing point. You will clearly see which CSRs are available by noticing the “Click to Chat” button underneath their profile image. If you see “Offline”, it simply means they are not available to assist at this time. From now on, the standard for getting help via a CSR is by visiting the Official Fennux Sim. If no one is online to help, you can click the bottom of the board to submit a ticket – which will be handled as soon as possible! We have changed the “Hydrated Constructable Fantasy Home” into just the “Hydrated Fantasy Home”. It is no longer constructable, rather it’s the same type of home as all of our other hydrated homes. You buy it, and rez it – and it works like a home. It’s still L$495 – the cheapest of our Hydrated Home options. And now it doesn’t take any time at all to turn it into a home. You might be wondering why we’re taking away the “constructable” feature? In all honesty, we were having numerous complaints about it having issues building. We’d rather just offer a guaranteed working product instead of something that has repetitive issues for a number of customers. If you already have the Constructable version, and you are not having issues with it – then that’s great to hear! However, if you find that you start having issues with it – send us a support ticket and we’ll take care of the situation for you. We will not announce the winner until around the 1st of August – because that is when we intend to release the coat into the Wishing Well. Yes, the winner’s coat will be available in the Wishing Well as an LE for the entire month of August. If you are not selected this first time, don’t worry! We are doing this as a test run – but we most likely will turn this into a very regular occurrence depending on how this goes. If you are selected as a winner, we will send a one-time payment of L$5,000 to you, as well as a give you a free Fennux with the winning LE Coat on it. We’ll also throw in a dish of “4 Fennux for 4 Weeks” kibbles just to spice things up. So, good luck everyone. Many will enter, one will win. DEADLINE: July 21, 2014 – Please do not send anything after this date. Each of these items are only L$45. You can copy them as many times as you need, you just cannot modify or transfer them. All proceeds go to the Relay For Life, so feel free to invite as many people as you can to come get one, as you know it’s for a good cause. The July 2014 “Tiffy” Limited Edition Fennux Coat is here! And that’s all there is to it! Enjoy your Tiffy LE Fennux Den, and your 12 Days of Reserve Food! WHERE DO I GET MY TIFFY LE FENNUX? The Wishing Well exists only on the Fennux Sim. We have 1 setup next to every Crafting Machine, and of course these Wishing Wells are used to turn any 12 Fennux Dens into 1 Tiffy LE Den (and 12 days of Reserve Food). The June 2014 “Inferno” Limited Edition Fennux Coat is here! And that’s all there is to it! Enjoy your Inferno LE Fennux Den, and your 12 Days of Reserve Food! WHERE DO I GET MY INFERNO LE FENNUX? The Wishing Well exists only on the Fennux Sim. We have 1 setup next to every Crafting Machine, and of course these Wishing Wells are used to turn any 12 Fennux Dens into 1 Inferno LE Den (and 12 days of Reserve Food). The Fantasy Fennux are Here! Learn all about the Fennux Fantasy gateway before you TP to the Fennux Sim and get started. Please read the above link as it explains exactly how to use the Fennux Fantasy Gateway, or check out the Fennux Gateway Video Tutorial. Visit either of the following locations on the Fennux Sim, but please keep in mind we only have 2 Fantasy Gateways on the sim, so you will have to take turns. It may be a little crazy at first. I recommend getting in lines if it gets too busy. The May 2014 “Cinco” Limited Edition Fennux Coat is here! And that’s all there is to it! Enjoy your Cinco LE Fennux Den, and your 12 Days of Reserve Food! WHERE DO I GET MY CINCO LE FENNUX? The Wishing Well exists only on the Fennux Sim. We have 1 setup next to every Crafting Machine, and of course these Wishing Wells are used to turn any 12 Fennux Dens into 1 Cinco LE Den (and 12 days of Reserve Food). Most Fennux however will have regular eyes from a starter den, very similar to Crafting – the only thing that is “LE” on most Cinco LE Fennux is the over-ride of the Fennux Coat. It’s more-or-less exactly like Crafting, except for the fact the coat will not pass.